Global trade had risen in 2013, but the growth in trade remained weak. The rate of growth in trade had more than halved in 2012. Over the longer term, the pattern of global trade continues to change. 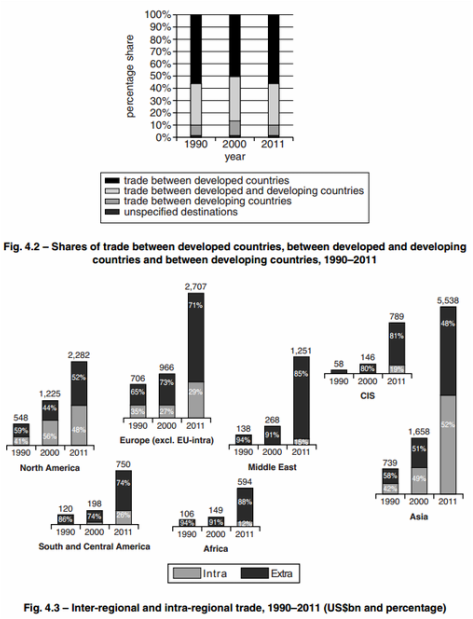 The share of world trade accounted for by trade between developed and developing economies continues to increase. There is also some evidence of greater regionalisation of trade. Some economists are uncertain about whether these changes in the pattern of trade can be explained by the theory of comparative advantage alone. The WTO’s 2013 World Trade Report also highlighted a fall in the growth of world trade from 5.2% in 2011 to 2.0% in 2012. This growth in trade was below the average rate of 5.3% for the previous 20 years. The reasons for this were slow growth in GDP in developed economies and the continued uncertainty about the future of the euro. Growth in world trade in the first quarter of 2013 remained sluggish, despite continued positive economic developments in the USA which had experienced 2.3% growth in GDP in 2012. Weak performance by economies in the EU offset the positive impact on world trade of the sustained growth in GDP in the USA. Fig. 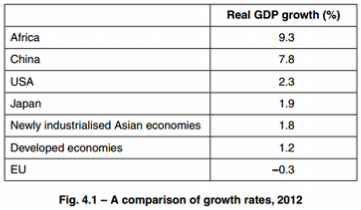 4.1 gives a comparison of growth rates in selected countries, regions and types of economy in 2012. The WTO’s World Trade Report of 2013 also provided useful insights into the pattern of global trade and changes in comparative advantage for selected economies and industries. Figs 4.2, 4.3 and 4.4 provide a summary of some aspects of the global pattern of trade. The extent of intra-industry trade is measured using an index. The closer this index is to 100, the more significant intra-industry trade is for a country. The closer this index is to 0, the more a country imports and exports goods and services produced by different industries. Fig. 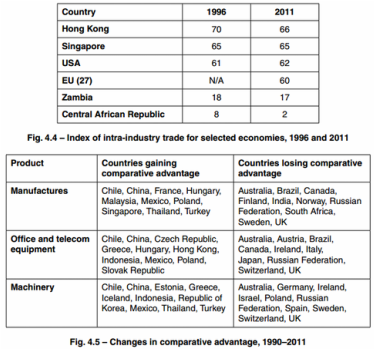 4.5 shows changes in comparative advantage for selected industries and countries. Note: The key for Fig 4.3 should read Intra and Inter, not Extra.